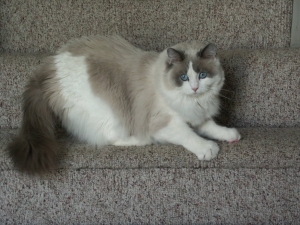 The Ragdoll breed is probably the most popular breed on our website. A great deal of this excitement comes from the notion that these cats are hypoallergenic and/or that they do not shed. Do not be fooled: neither of these bits of information are true of the Ragdoll. Ragdolls are very nice cats, but as with all purebreds of any type, personalities vary by individual. While they are generally known as easy-going, we have had fairly unpleasant Ragdolls in this rescue, shy Ragdolls, hyper Ragdolls and those that were absolutely not suitable for children. In general, this is a breed with a medium-length coat, calm personality and good looks, but each cat must be fitted to the right family. Ragdolls are medium-coated cats and regular brushing/combing is necessary. They typically do not have the long, thick coats of many Persians; therefore, they tend to be easier to care for. However, they do shed and have the same maintenance needs as any animal with a long coat. For the most part this breed is healthy. We have seen a few with dental issues and cardiomyopathy (an enlarged heart) is starting to become a problem every now and then. As mentioned above, each personality should be fitted to the right type of family. This is not a “one type fits all” breed. In general, this is a calmer breed with a gentle, quiet disposition.